Raisen is a town and a municipality in Raisen district in the Indian state of Madhya Pradesh. On the 18th (Thu), take in the spiritual surroundings of Hazrat Peer Fatehullah Shah Baba. To find photos, ratings, reviews, and tourist information, read our Raisen trip planning tool . Warsaw, Poland to Raisen is an approximately 18.5-hour flight. The time zone changes from Central European Time to India Standard Time, which is usually a 4 hour difference. Plan for much warmer temperatures traveling from Warsaw in April, with highs in Raisen at 45°C and lows at 26°C. You'll have a few hours on the 18th (Thu) to wrap things up before traveling to Agra. Start off your visit on the 19th (Fri): make a trip to Agra Fort, then admire the landmark architecture of Jahangir Mahal, and then admire the landmark architecture of Taj Mahal. For ratings, other places to visit, traveler tips, and more tourist information, use the Agra online vacation planner . You can drive from Raisen to Agra in 10.5 hours. Another option is to fly. In April, daily temperatures in Agra can reach 44°C, while at night they dip to 24°C. Wrap up your sightseeing on the 19th (Fri) to allow time to drive to New Delhi. 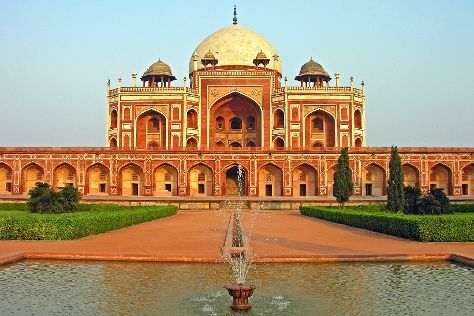 On the 20th (Sat), steep yourself in history at India Gate and then take in nature's colorful creations at Humayun's Tomb. To find where to stay, maps, other places to visit, and tourist information, use the New Delhi trip itinerary planner. Drive from Agra to New Delhi in 3 hours. Alternatively, you can take a train; or take a bus. In April, daily temperatures in New Delhi can reach 43°C, while at night they dip to 25°C. On the 20th (Sat), wrap the sightseeing up by early afternoon so you can travel back home.